This entry was posted in English Literature, Uncategorized and tagged JR Ackerley, My Dog Tulip, NYRB Classics by Simon Lavery. Bookmark the permalink. Oh dear. *Definitely* not for me. No matter how long ago, that kind of mixture of selfishness and cruelty would make my blood boil! Oh that sounds horrible! Thank you for reading it so we don’t have to! Liz: I’ve singled out the unpleasant parts, but there are lighter moments – but they’re tainted IMO by the nasty side to the owner. 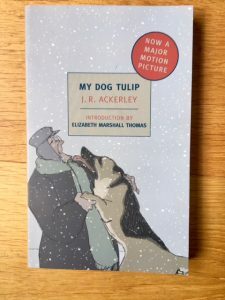 A riddle : “She enjoyed the book if only because, as Norman had said, the dog in question seemed even more of a handful than hers and just about as unpopular […] His dog intrigued her, though she was disconcerted by the almost veterinary intimacies with which he indulged the creature.” Who wrote this ? Who is “she” ? The author is Alan Bennett, “she” is the Queen. This is taken from The Uncommon Reader. Surely you must have read it, or at least heard of it ? It’s very popular among bloggers and it’s a book I recommend to all my book-loving friends. My bookseller (who adores Mr B) told me a few years ago that it even was on the reading list at the university. How bizarre! Your answer popped up just as I hit ‘reply’ to your question! I’m glad I was right. I haven’t read this particular Bennett, though he’s a writer I enjoy reading. Thanks for the teaser, though. Our weather here in Cornwall is looking a bit more springlike at last, so I hope to have a relaxing and pleasant weekend; I hope you do, too, Izzy. Meanwhile I’m trying to catch up on a backlog of books read to post about.